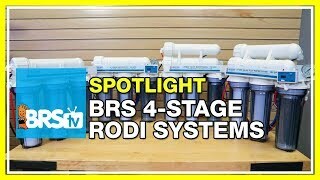 BRS 4 Stage Plus RODI Systems are perfect for reefers who have city water treated with chlorine, or reasonably clean well water. Self-contained on a single bracket making them ideal for tight spaces or where a non-permanent connection may be required. Every BRS RODI system can be installed within minutes with the easy to use Mur-lok push-connect fittings that allow you to make leak-free connections. 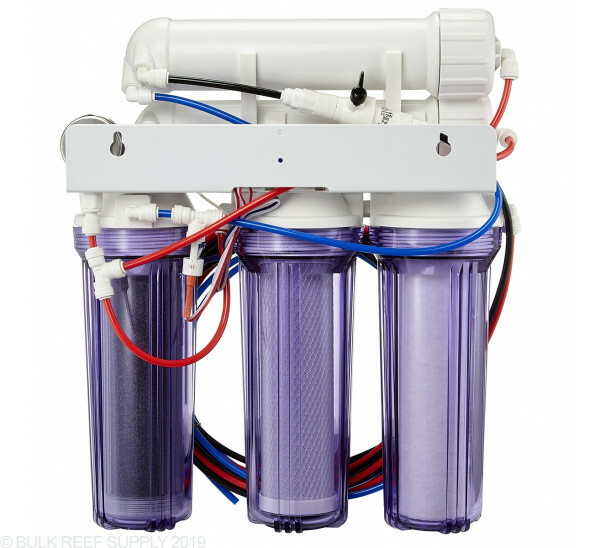 Bulk Reef Supply RO/DI systems only use the latest filters and components in Reverse Osmosis technology. We have designed our RO/DI units especially for reef tanks, but they can produce perfect water for other types of saltwater and freshwater aquariums too. 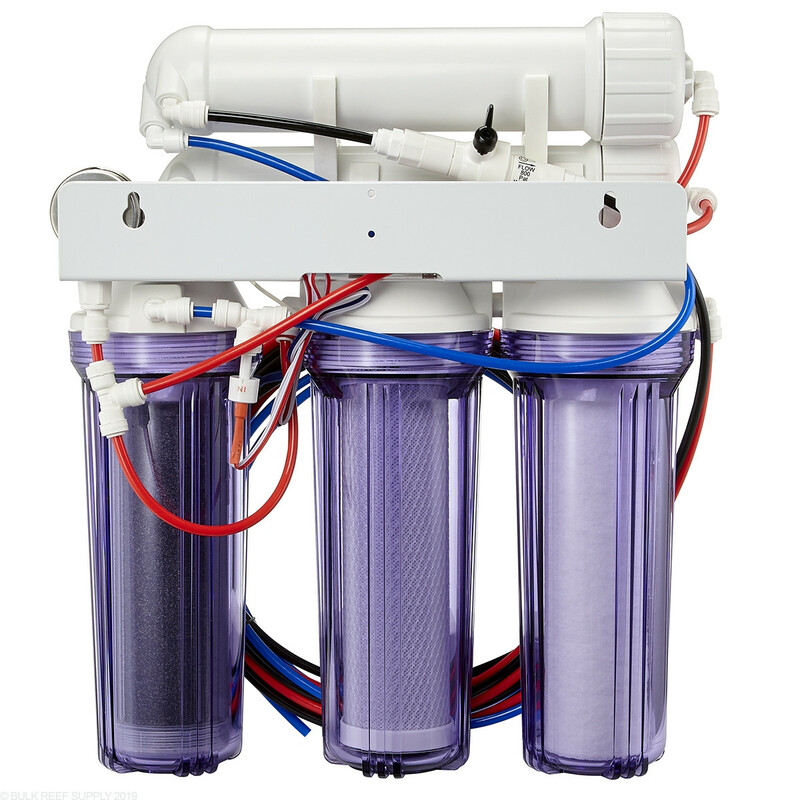 If you have a well, or you are connected to city water we offer a variety of RO/DI systems that will fit your aquarium's needs. HM Digital Inline Dual TDS Meter - Instantly know the purity of your water, before and after the deionization stage. The inline probes come pre-installed and with the simple push of a button, your waters TDS is displayed on the LDC monitor. Glycerin Filled Pressure Gauge - Reverse Osmosis membranes require a particular amount of pressure to operate efficiently, and using a pressure gauge will help ensure your system is performing correctly. Pressure Gauges also work as a great indicator of when sediment or carbon blocks start to become clogged. 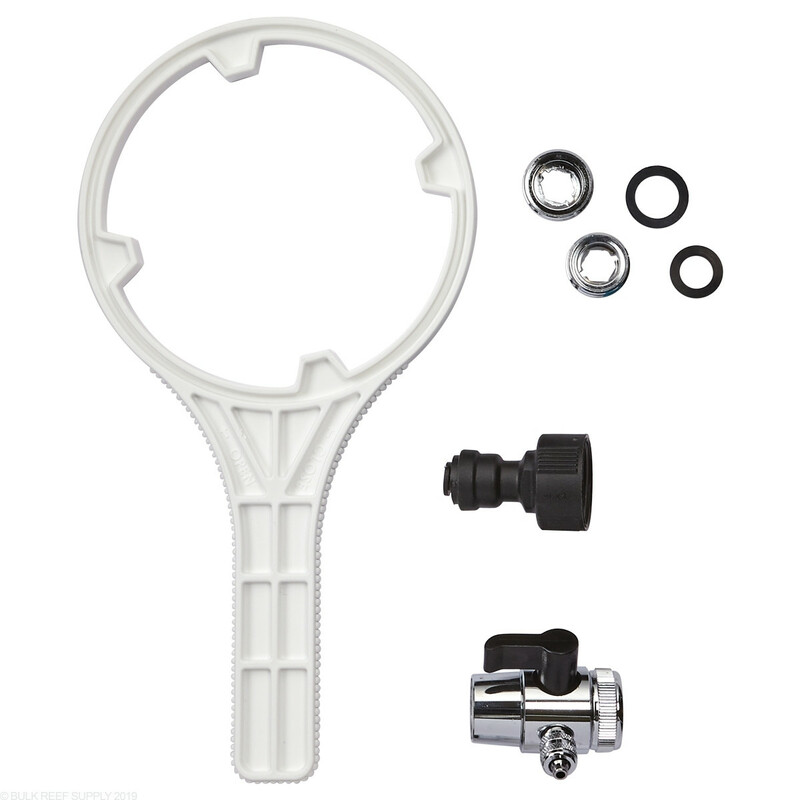 Membrane Flush Valve - Keep your RODI system running like new by flushing the membrane for a few minutes before and after each use. Membrane flushing helps remove any built-up mineral deposits from your membrane, that could harm performance, or even cause a complete clog. 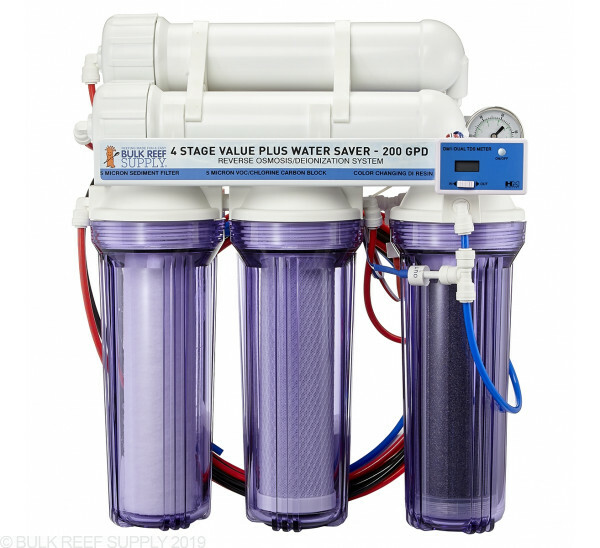 All Bulk Reef Supply RO/DI Systems are covered by our Limited Lifetime Warranty. 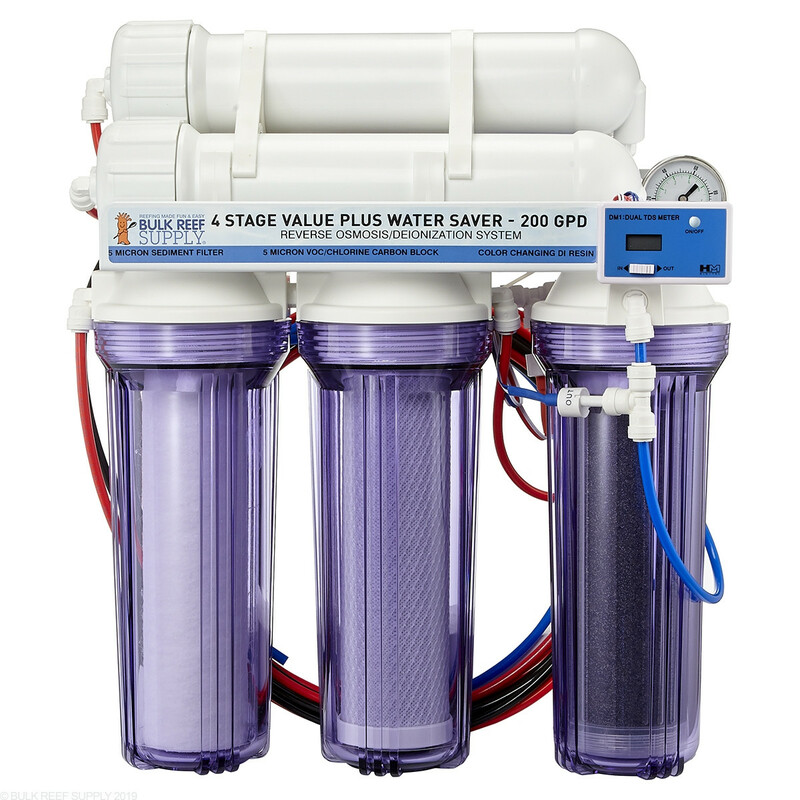 4 Stage Value RO/DI Systems - Perfect for city water that is treated with low amounts of chlorine, or well water with very minimal contaminants. Four stage RODI systems are a great solution if you only connect your RODI system temporarily or have little space to dedicate to storing a RODI system. 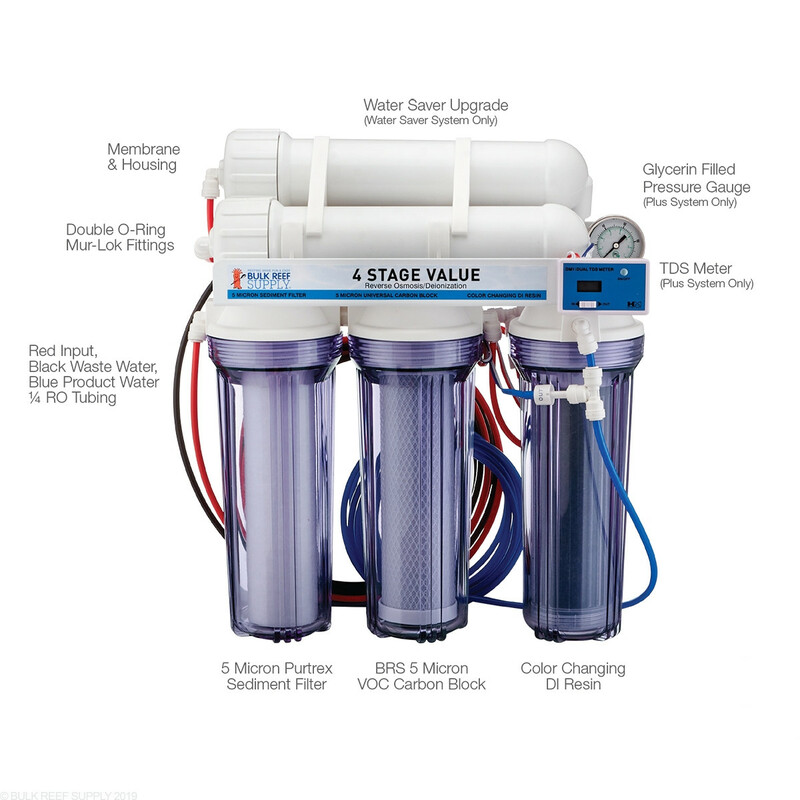 5 Stage Premium RO/DI Systems - Our most popular systems handle common impurities found in well water along with most types of city water treated with chlorine including small amounts of chloramines. 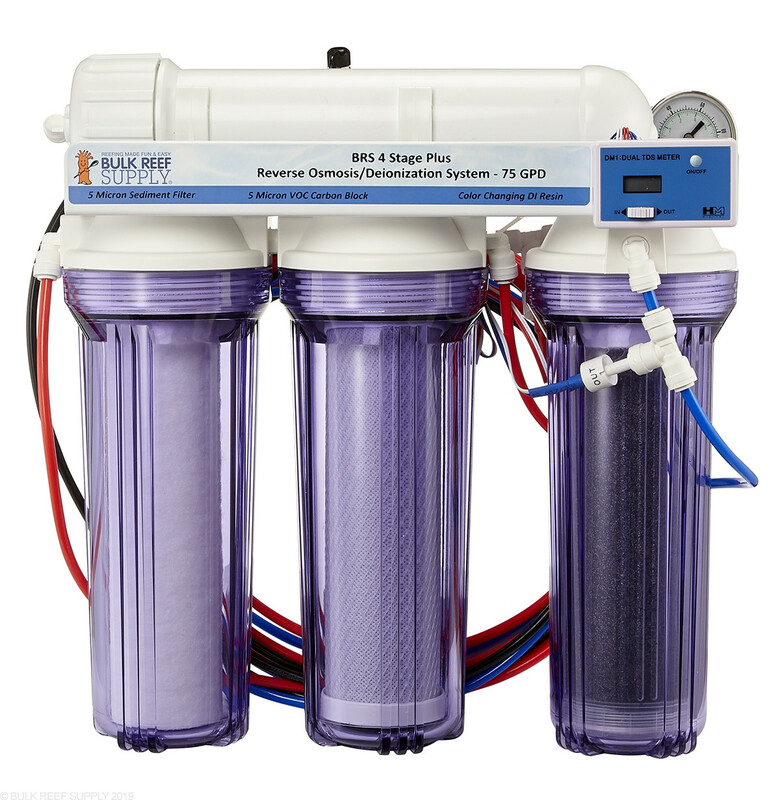 6 Stage Deluxe RO/DI Systems - If you are not sure what is in your water, or it contains excessive amounts of TDS or hard to remove contaminants like chloramines, phosphates, nitrates, silicates, etc. The BRS 6 Stage systems are designed to effectively treat any water your home may have prior to using it in your aquarium. The Dual DI stage helps with the hard to remove ions like ammonia, phosphates, silicates, etc. 7 Stage Pro RO/DI Systems - Perfect for almost any water condition, but if you have contaminants that use excessive amounts of DI resin, the 7 Stage RODI system is the ideal choice. It uses cation and anion single bed resins that give you added control and cost savings over traditionally used mixed bed resins. Most water supplies tend to exhaust either the positively or negatively charged resin more quickly than the other, and by separating the standard mixed bed resin into single beds, you are no longer throwing away good deionization resin. RO/DI Body Dimensions 16" x 6.25" x 15.5" 16" x 7" x 15.5" 16" x 7" x 15.5" 16" x 7" x 15.5"
Water pressure can be increased by adding a booster pump before your RO/DI system. Low pressure may cause the RODI system to produce excessive waste water. Pressure over 90 PSI may cause damage to the RO/DI units filters and components. Seems like every project I take on these days turns into another example of Murphy's Law. Something has to go wrong or turn into much more than it should be. So this is a HUGE thank you to BRS! Right out of the box, everything was hooked up and ready to go. I planned to temporarily set up my RO unit in a spare bathroom until I get a utility sink installed in my basement and move it there. I found the correct adapter for my faucet, hung the unit on the wall - connected the input line to the faucet adapter, ran the black line to drain in the tub and ran the blue line to a bucket sitting in the tub. Could not have been easier or quicker. I am impressed and again - Thank you! Wow! Installed this unit next to my existing Softener/RO system for my home that doesn’t have the output (or designed for) creating water for water changes. Mounted to my basement wall, tapped into my existing lines, installed a dedicated on/off valve for the BRS unit and was cranking out water in 5 minutes from the time I came down stairs. The longest part of the install was waiting for the system to fill up with water :) Highly Highly recommend if you are not creating your own RO water. Works great and installation is super easy. Note: doesn’t come with any mounting screws l, no biggie. Also does not come with any fittings to splice into exhisting RO lines. 1 T fitting and an on/off valve and I was all I needed, any mega hardware store has them or the folks I bought my home softener system from gave them to me for free. 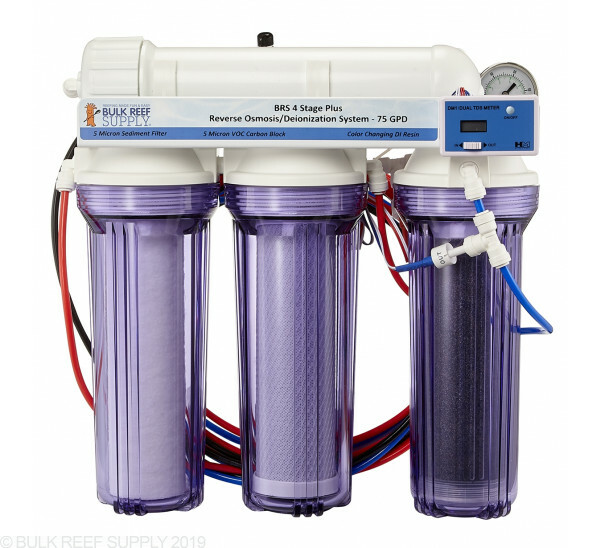 This was the first RO/DI unit that I have ever purchased and I purchased from Bulk Reef Supply because of their commitment to educating their customers with countless videos on being smart in this hobby. Not only was it a great investment in a system that is needed for this hobby, but I am fully invested in Bulk Reef Supply as my “go to” for all of the supplies I need for my hobby. It was simple to set up and came with all of the necccesary attachments. I filled my 16g biocube with water in about 2 hours the first time I utilized the unit. Now, as I continue to make water for changes and maintenance, I fill up 5 gallons within 1/2 hour which is amazing. 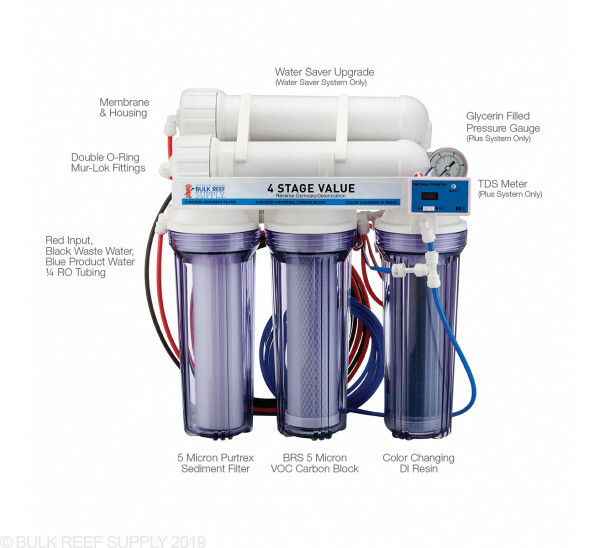 I really appreciate the tutorial that Bulk reef supply made around their RO/DI units, explaining the differences; it helped me to make an informed decision when making my purchase. Definitely worth saving the money and making this investment. Thank you Bulk Reef Supply!!! Works great right out of the box! I no longer get white slime in my sump and ATO reservoir since switching to this setup. Highly recommended! After fighting leaks with a coralife pure Flo 2 for a month I bit the bullet and purchased the 75 gpd premium. Excellent leak free unit. Zero TDS water with some higher end features tied in. Shipping was safe and secure. Love this RODI system! .... Very well built and easy to use, so much better than going back and forth to the LFS for RO water. BRS is top notch in every way, I have yet to be unsatisfied with a purchase or there customer service! This works great but only generates about 100 gpd for me (with a water pressure of about 60). Wish it were twice as fast. Great unit! Bought this rather than the aquaflex for 2 reasons. Has a bypass connection to flush system, and a tds meter. Also included an auto shut off for 55 gal drum .My well is set 52 to 73 lbs presure tank with a tds of 170 coming out of well head. The 150bgpd is a triffle slow. I fill a 55 gal drum in about 10 1/2 hrs. Knowing my particulars, I am glad I went with the 150! Only recommendations is perhaps a 1 page of instrunction to avoid calling customer service, who were responsive. By far the best unit for the price in the market. 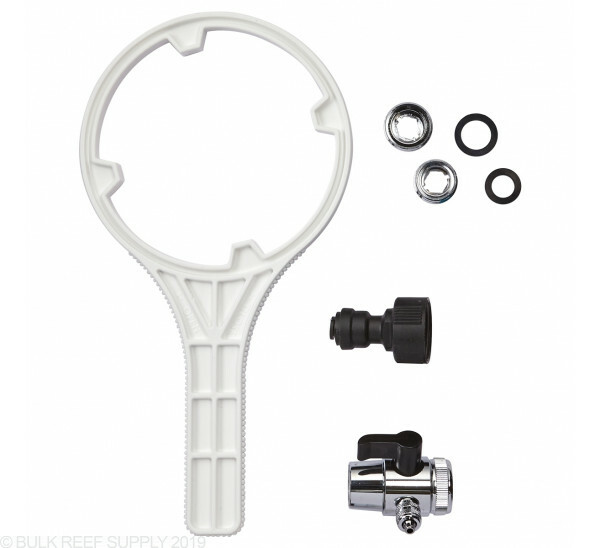 Super high quality and super easy to install with the murlok lines. One suggestion is get the float valve auto shut off unit as I have already forgotten about it twice and had some minor water spillage. I bought this in addition to the nuvo 20, i wanted to start the tank off right with as perfect water as i could get to help prevent any issues down the road, kinda like insurance. Does the 100 gpd value plus model come with an automatic shut off valve? can you confirm those are check valve 90 elbows on the membrane housing? 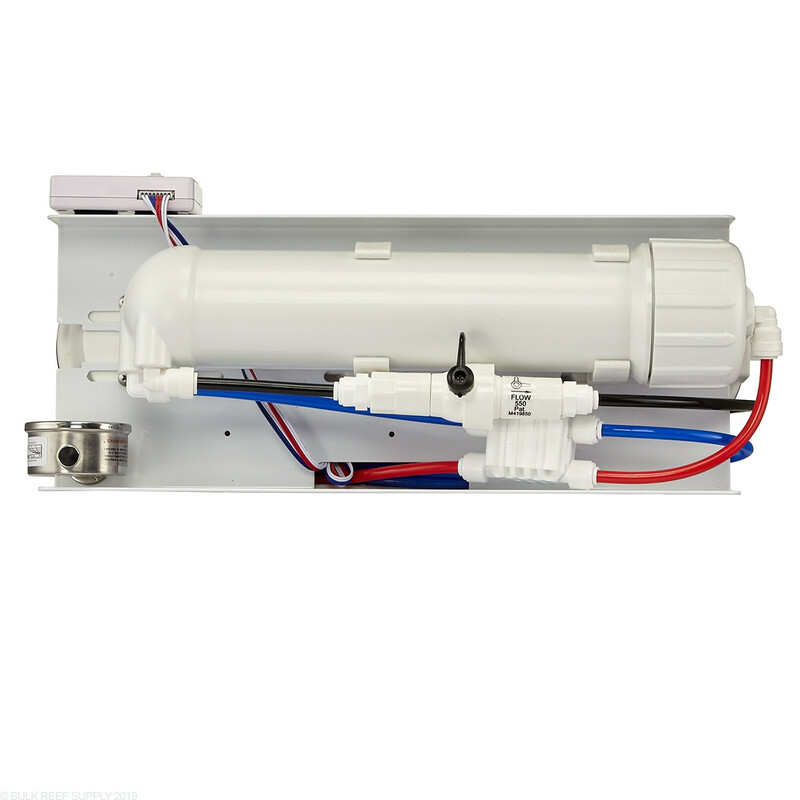 This system will come with an auto shut off valve as well as check valve elbows so all you will need is a float valve to have the system fill a container and shut off the system when it is full. Have a great day! Is the waste line on the 75 gpd 4 stage 1/4 or 3/8 ? I want to place order and want to order the proper waste saddle clamp .. thank you !! The waste line on the 4-stage 75gpd system is 1/4". Have a great day!